A brochure is an important marketing tool for every business. It not only presents your products/services to the potential customers and investors but also serves as an instrument to improve your goodwill. This is an attractive advertising piece that has been used for a long time by businesses, in all parts of the world, to create buzz about themselves. It is still very relevant, what with the introduction of e-brochures. You can also capitalize on its power by getting a beautiful brochure that packs style and substance in fine proportion. And it is not difficult either as you can hire a brochure designing company to get the work done. There are many such companies that deal with brochure, fliers and leaflets designing. But your aim should be to find best brochure design services as they will bring you the best results. 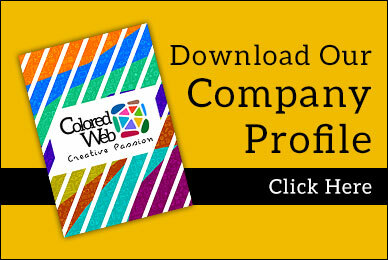 And we at ColoredWeb take pride in calling ourselves a brilliant brochure designing company in Mumbai. We have a diverse and exhaustive portfolio and we deal with all types of designs such as two fold, tri-fold, French fold, e-brochure, etc. Also, having an exposure in different niches like travel, medicine, hospitality, education, gives us a fine command over the nitty-gritty of brochure creation. We ensure a competent and creative brochure design for your business at the best possible price. Our brochure design templates are the best in town and take inspiration from the latest trends and styles. With us, you can expect premium quality in terms of creativity as well as presentation. So, if you want to own a wonderful brochure that you can offer with confidence at meetings and promotions then you have got us by your side. We are only a click/call away. Just get in touch and tell us your requirements. You will be served with exactly what you desire. A - 501, Bhagya Apt., Shivam Chs. Ltd., Triveni Nagar, Kurar Village, Malad (East) Mumbai - 400097 Maharashtra.